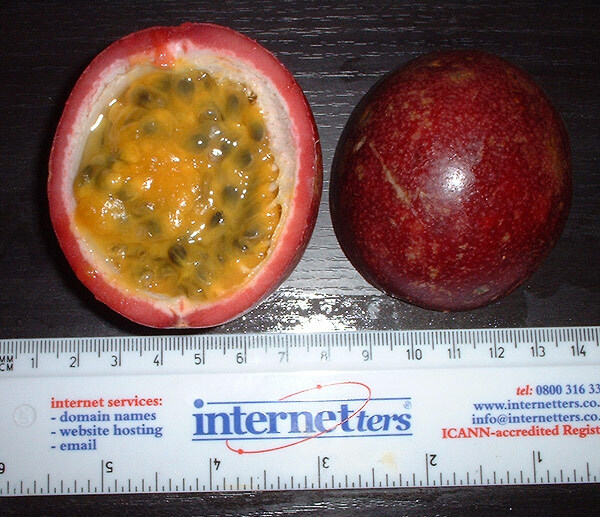 Passion fruit | Passionfruit | Passiflora - are the fruit edible? Passion flowers Passiflora | Which Passion fruit are edible? 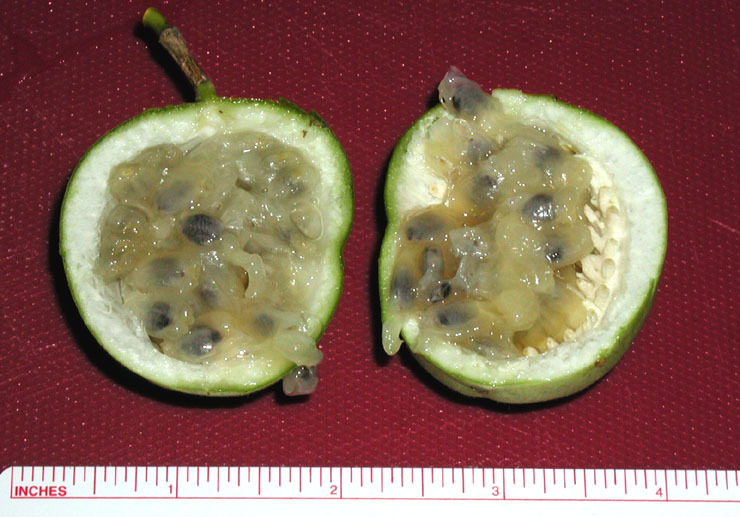 The most widely grown Passionfruit are the hard shelled P. edulis varieties. These all germinate very readily and keep relatively well. Perhaps 40 or more Passiflora have fruit we would judge as edible, of those 10 or so may be grown as food crops for local consumption, but most of these have soft fruit which do not keep or travel well. e.g. P. tripartita var. 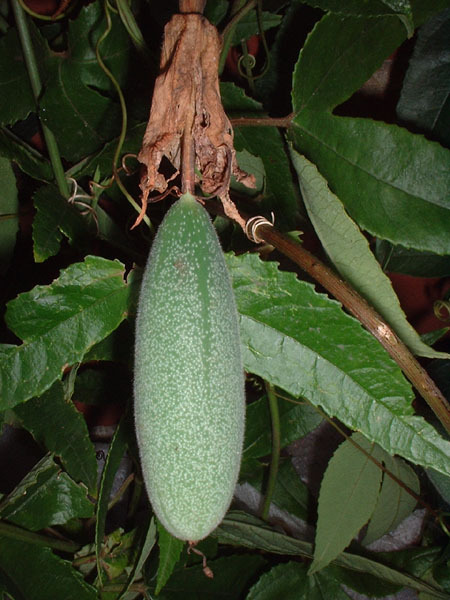 mollissima and other Tacsonia which taste good but deteriorate quickly after harvest. I have tasted some which have made their way to UK and they are not great. Many also are quite full of crunchy seed which are not appealing. The world market production is estimated by Passion fruit juice, a great site with plenty of information about edible passion fruit, at 640 000 metric tonnes per annum, the bulk of which is the yellow fruited P. edulis flavicarpa. Commercially available passion fruit juice is almost always P. edulis based. The purple and yellow (flavicarpa) varieties and crosses between the two are grown commercially everywhere from South America to Africa, Asia, Australia and U.S.A. The juices and indeed the fresh pulp from the fruit with or without the seeds are used worldwide in exotic tropical drinks, cocktails, cordials, liqueurs (e.g. blended with Cointreau and Cognac), chocolates, sauces, ice creams, sorbets and more. Type ‘Passion fruit recipe’ or ‘Passion fruit drink’ into Google to see what is out there. Even better buy Patrick Worley’s great Passionfruit cookbook. Passion fruit and their juice bring their unique taste and smell, a combination of acidity and sweetness with an intense distinctive perfumed aromatic smell that almost defines the tropics. Many would say that as a group they are the best tasting fruit and juice in the world. It is a rare tropical juice mix without passion fruit juice in it, often as just a small percentage as its intensity is so great. In UK Rubicon Exotic Juice Drinks make an excellent range of exotic drinks including still and fizzy purple passion fruit juice in bottles, cartons and cans. The cartons are very widely available and are very good indeed. Unbeatable outdoors in summer. 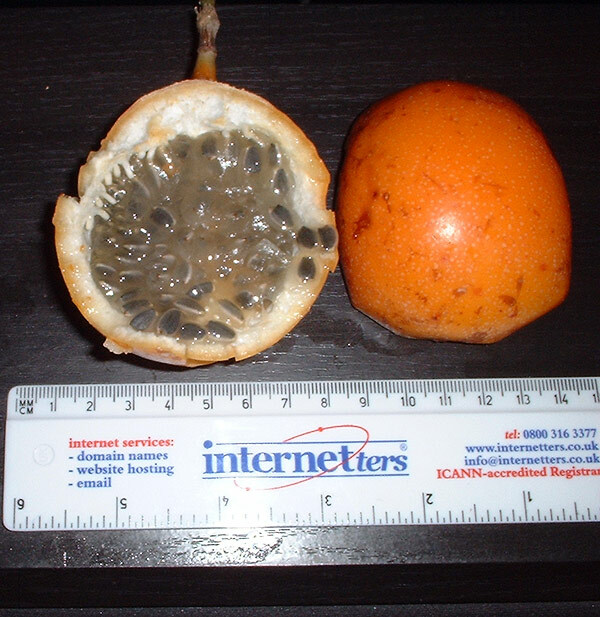 The fruit are widely available worldwide, usually being P. edulis, purple fruit, P. edulis flavicarpa, yellow fruit or occasionally P. ligularis, orange fruit with a hard brittle shell. These all keep relatively well compared with other species. Opinions vary widely as to which are the tastiest fruit, partly this is of course subjective. If fruit are picked too early however, and are not given time to ripen fully in the sun, they can be lacking in juice and taste even if grown in ideal conditions. Many do not travel well so if they are not grown locally you will never know how good they are. Also if a plant is being grown outside its normal habitat with regard to either sunshine, day length, rainfall, temperature or soil, it may not taste as good as it should. 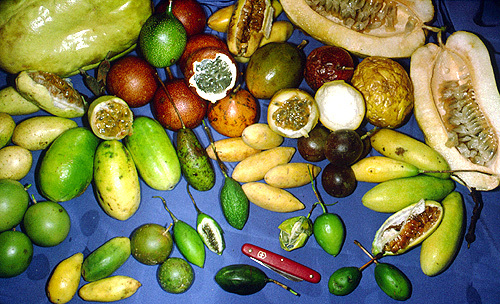 The fruit of some edible species are shown above. A tough but brittle shell with slightly unattractive grey pulp. 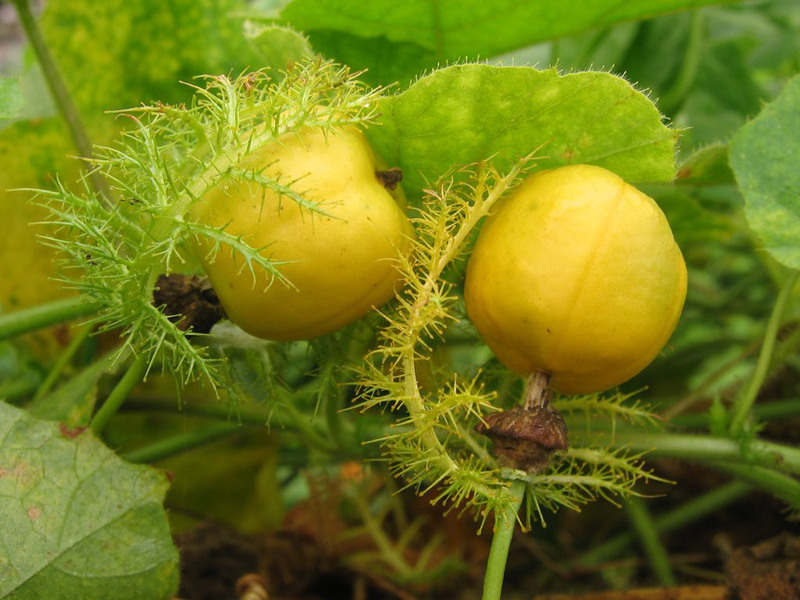 Mark Cooper, from California, and others, report that it is one of the tastiest fruit. 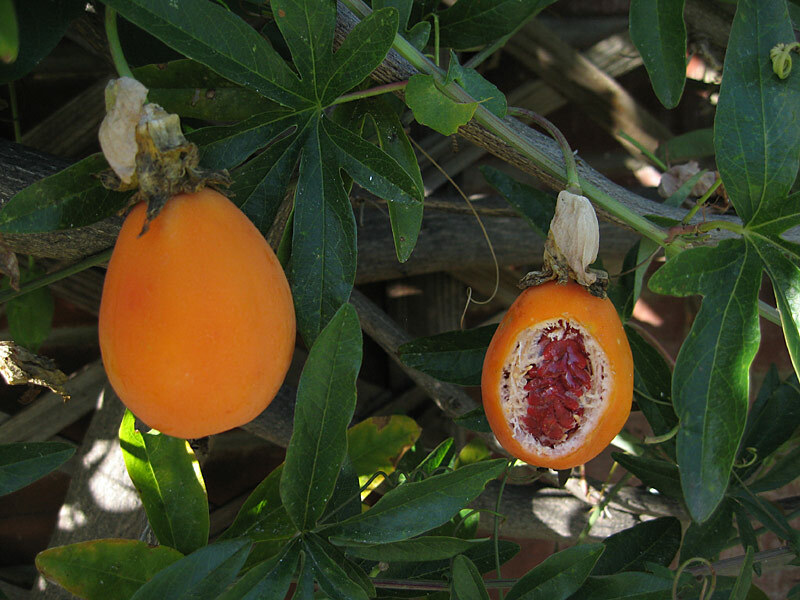 In UK however, where it is imported and sold in supermarkets as Granadilla or ‘Golden Passion Fruit’, it is variable & can sometimes be dull and insipid, but at its best is still very pleasant. It has a nice perfumed grape like aroma and seems far less acidic than P. edulis. Despite the hard shell it does not keep that well. It is also very expensive in UK. Martin Murray reports that P. ligularis is farmed in Costa Rica at about 1400 metres upwards. Daytime temperature approx 30°C and nighttime 20°C. Soil wet, humidity high, and at some times of the year fed with citrus fertilizer (to increase fruit acidity and improve taste) and cattle manure. He describes the taste as very good and grape like. The fruit are often described as insipid but that is probably due to species confusion with P. tarminiana fruit which are not very great. Martin Murray reports that grown in Costa Rica it has a lovely sherbert taste. The plants are being grown there outside their usual conditions under shade cloth, probably not native to Costa Rica, and so are prone to disease and are scrapped each year and fresh plants grown from seed. “Fruits and vegetables can be classified as climacteric or non-climacteric. Climacteric fruit continue to ripen after harvest, whereas non-climacteric do not. Ripening is a process that includes development of color, flavor and texture (softening).” Elizabeth Baldwin USDA © Cirad 2001. 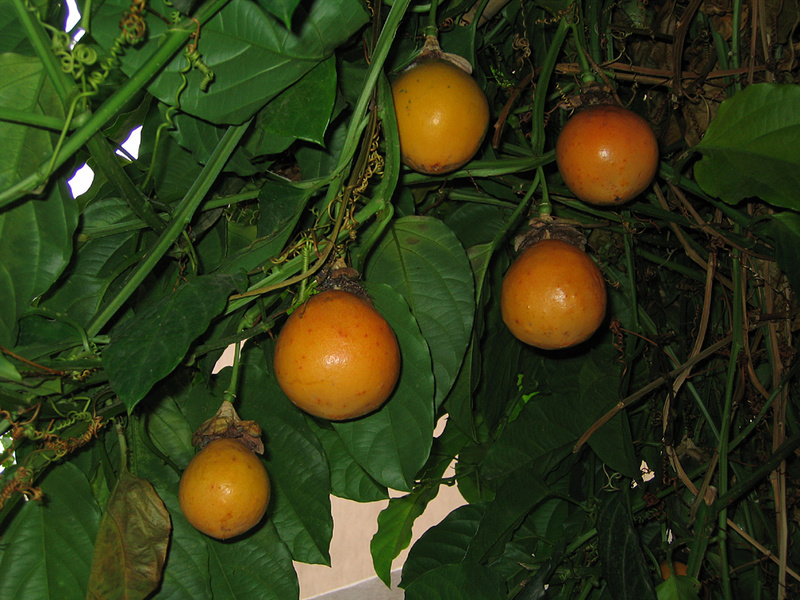 Passion fruit are climacteric, other examples are banana, mango, papaya, avocado, and guava. This means that the ripening process continues after abscission (when the fruit drops). Compare this with the non-climacteric strawberry, an unripe strawberry never ripens once picked too early. I think we tend to assume that once the Passion fruit has dropped it is ripe. For some species e.g. Decaloba it may be, and for eating it may be, but if we want viable seed from it, to maximise chances of successful germination, it will do no harm to leave the fruit in a sunny window for 1-2 weeks after it has dropped. 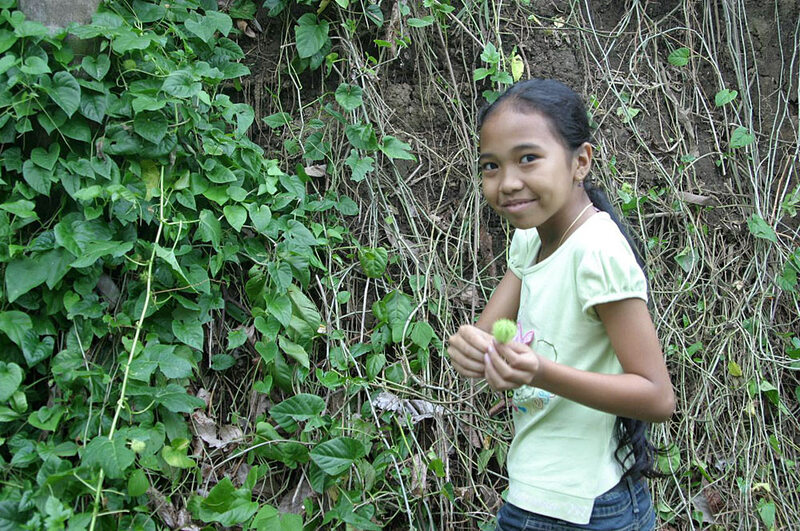 Wild collectors report that fruit picked from the vine may contain seed at different stages of ripening, including viable seed though its keeping properties are reduced. . An adaptation perhaps so that even if an animal eats the fruit early instead of waiting for it to drop some seed will still germinate. 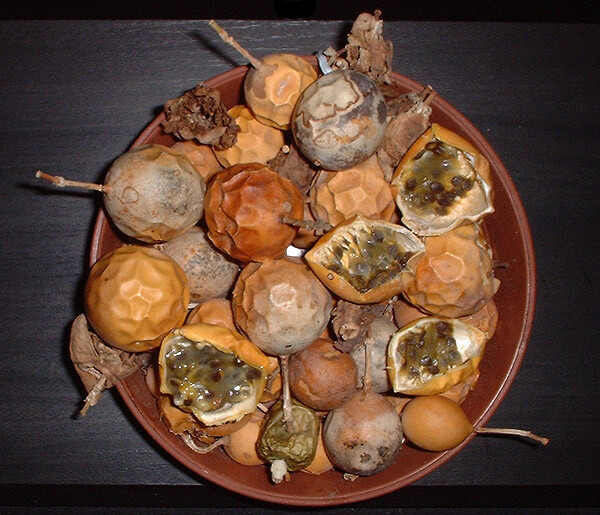 In Guam P. suberosa fruit is eaten by bats that land on the forest canopy to eat them.